Yadier Molina, who began the day with a .175 batting average, put St. Louis in front with an RBI double against Ross Stripling (0-1) in the first. ST. LOUIS — Cardinals manager Mike Shildt praised Marcell Ozuna for his effort. 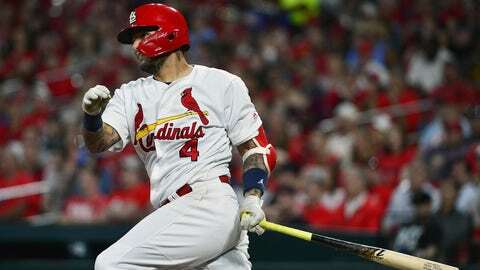 Ozuna misplayed Kiké Hernández’s drive in the eighth inning, but Yadier Molina drove in three runs and Paul Goldschmidt homered to lead St. Louis to a 4-0 victory over the Los Angeles Dodgers on Tuesday night. The Cardinals already had a 4-0 lead when Hernández led off with a drive to left. Ozuna went back and climbed up the wall, but he misjudged the ball and tumbled onto the warning track as he tried to make the play. Hernandez’s drive bounced over for a ground-rule double, but Mike Mayers and Andrew Miller managed to escape the threat. After Ozuna fell, he stayed on the ground for a little while before getting back up. “A for effort,” Shildt said with a smile. “He’s made a couple of plays like that where he’s actually caught it and robbed a homer. I think he read it off the bat as a ball that was going to go and obviously have a good chance to get out of the ballpark. Ozuna called it part of the game. “I was too aggressive,” he said. Los Angeles manager Dave Roberts believed Hernández had a home run. Dodgers ace Clayton Kershaw pitched six innings of two-run ball in a rehab appearance for Double-A Tulsa. He struck out six and walked none while throwing 81 pitches. The 31-year-old Kershaw developed inflammation in his left shoulder early in spring training. He is expected to rejoin Los Angeles’ rotation this weekend. St. Louis second baseman Kolten Wong was hit by a pitch for the first time this season. He has been plunked 55 times for his career. Cardinals: RHP Carlos Martinez is on schedule to throw his first bullpen session Friday. He went on the 10-day injured list March 25 for a right shoulder cuff strain.